Kementerian Desa, Pembangunan Daerah Teringgal, dan Transmigrasi Republik Indonesia - Kemendesa PDTT or referred to as "Kementerian Desa PDTT" is the Ministry of Village, Development of Disadvantaged Regions, and Transmigration of Republic of Indonesia. The Ministry is one of ministry in the Indonesia Working Cabinet (Kabinet Kerja) with main task to assist the President of Republic of Indonesia in conducting affairs in the field of rural development and rural areas, rural community empowerment, accelerating the development of disadvantaged areas, and transmigration. According to Kementerian Desa PDTT's profile as cited by JobsCDC.com, Kementerian Desa PDTT is under and responsible to the President of Republic of Indonesia. 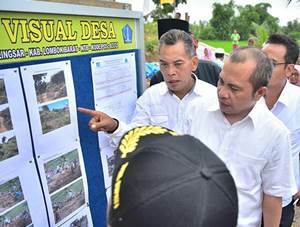 Kementerian Desa PDTT is headed by a Minister for Village, Development of Disadvantaged Regions, and Transmigration (Since 27 October 2014 held by Marwan Ja'far). Kementerian Desa PDTT has its legal domicile in Jakarta and its head office is located at Jl Abdul Muis No 7 Gambir, Jakarta. Due to strengthen its team, Kementerian Desa, Pembangunan Daerah Teringgal, dan Transmigrasi Republik Indonesia is pleased to announce the following vacancies for immediate recruitment. Minimum background in Diploma or Bachelor Degree (D3/S1) or equivalent, majoring in any field. Diploma Degree (D3) or equivalent : minimum 6 years of experience in the field of rural communities empowerment or related. Bachelor Degree (S1) or equivalent : minimum 4 years of experience in the field of rural communities empowerment or related. Hands-on experience in facilitating cooperation with local government apparatus of regency / city. Hands-on experience in handling assistance and advocacy to the rural community in order to communities empowerment. Hands-on experience in community organizing between villages and rural areas. Hands-on experience in facilitating discussion of Village and / or between villages. Have technical expertise in facilitating rural groups in discussion of Village and / or between villages. Familiar with local customs, culture and wisdom of the community in the duty location, including being able to communicate using local language. Computer literate, minimum Microsoft Office (MS Word and MS Excel) and email application. Excellent verbal and written communication skills in Bahasa Indonesia. Able to facilitate and work together in teams. Maximum age of 50 years old at the time of registration. Preferably living in same city as work location. Minimum background in Diploma or Bachelor Degree (D3/S1) or equivalent, preferably majoring in Environment, Planologi, or Agricultural Technology. Hands-on experience in facilitating regional / environmental development and other regional-based activities. Computer litarate, minimum Microsoft Office (MS Word and MS Excel) and email application. kspkwilayah1@gmail.com : for Aceh, North Sumatera, Lampung and Jambi. kspkwilayah2@gmail.com : for Central Java, East Java and Bali. kspkwilayah3@gmail.com : for Central Kalimantan, South Kalimantan and North Kalimantan. kspkwilayah4@gmail.com : for South Sulawesi, West Sulawesi, Central Sulawesi and South East Sulawesi. kspkwilayah5@gmail.com : for NTB, NTT, Maluku, North Maluku and Papua. JobsCDC.com now available on android device. Download now on Google Play here. Please be aware of recruitment fraud. The entire stage of this selection process is free of charge. Kementerian Desa PDTT - Recruitment D3, S1 Rural Area Assistant Kemendesa May 2017 will never ask for fees or upfront payments for any purposes during the recruitment process such as transportation and accommodation.